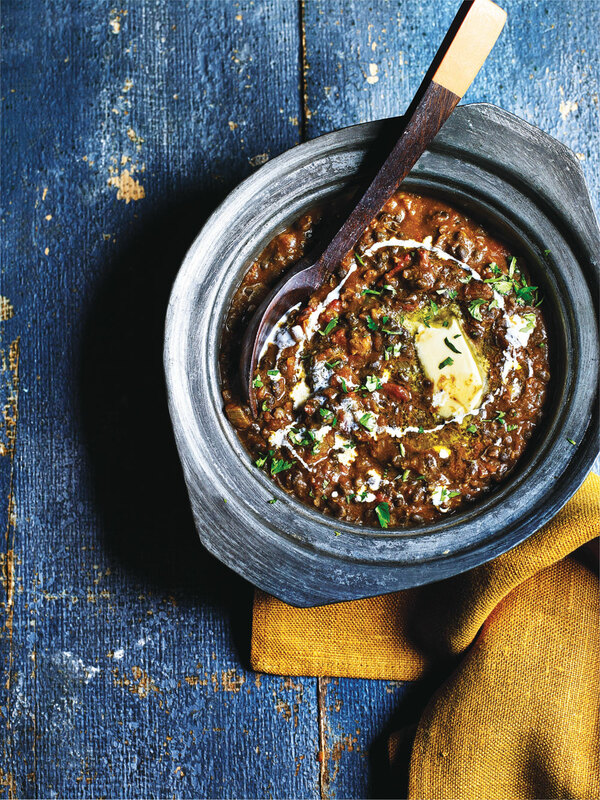 1In a large saucepan over low–medium heat, simmer the urad dhal lentils in water until fall-apart soft. You might need to top up the water from time to time while the lentils cook. 2After about 3–4 hours of simmering, the lentils will be perfectly soft. 3Strain the lentils, reserving the cooking water, and set it all aside. To save time, the following steps can be done while your lentils are simmering. Heat the oil in a large frying pan over medium–high heat. 4When visibly hot, stir in the chopped onions and fry for about 10 minutes until soft and lightly browned. Stir in the mixed garlic and ginger paste and fry for about 30 seconds before adding the chopped tomatoes and the spices. Cook for another minute, then add about 125ml (1/2 cup) of the strained lentil water. Bring this to a simmer and add the cooked lentils. Cook over high heat for five minutes, adding more strained water if needed. 5The dhal should be thick and soupy. 6To finish, season with salt to taste. I recommend about two teaspoons, which I think works really well, but I feel how much salt you add is a personal thing. Add it to taste. 7Makhani means butter so you can’t leave that out. I recommend using about three tablespoons but if you don’t want to use that much, the dhal will still be delicious. Stir most of it into the dhal and then top with whatever is leftover to melt on top. 8Drizzle the cream over the top and sprinkle with the chopped coriander and you are ready to serve your masterpiece.